Hodgkins' House, near Acadia, Bar Harbor with ocean views of Eastern Bay. Paul & I inherited this beautiful home a few of years ago. We completely renovated the kitchen with granite countertops and added many touches to make it a cooks kitchen. About nine years ago we purchased my Aunt and Uncle's Pine Cone Cabin, next to ours on Green Lake, and began our seasonal rental business. As yet there is only a few reviews for Hodgkins' House but there lots for Pine Cone Cabin, if you would care to see more reviews. We worked like beavers tearing it down to the outside walls and rebuilding it. I than had the fun of decorating it with things from the LL Bean outlet in Ellsworth. We have been so blessed with having wonderful renters .that we decided to rent Hodgkin' House as a weekly or monthly summer rental. It's a beautiful place to hold your special event, weddings, reunions, and get togethers, with manicured lawns and plenty of off road parking. Check with owner for pricing and rules for more than six. It is organically sprayed once a month for ticks and mosquitoes. Both bathrooms are fully stocked with fluffy towels, shampoo, conditioner, bar soaps, hair dryer and first aid kit, just in case. There is a packed beach bag, cooler and stroller in the garage. The mountains of Acadia National Park. Hodgkins House overlooks Eastern Bay and the Mountains of Acadia. Our garage has 2 bays with remote controlled door openers. Thirsty bathing towels and LL Bean beach towels are provided. 52" LED Hi Definition TV with sports channels. Beautiful view of Eastern Bay. 12 cups coffee maker and Keurig, with coffee, teas, hot chocolate and sweeteners provided. Wide slot toaster, plenty of room for bagels. Our game room is 2 acres of manicured lawn. Get outside and play croquet, bocce ball, ladder golf or buoy ball. Cribbage board, cards, chess set, Scrabble, Head Bands etc. 3 Plasma cars, play kitchen, sand pile with tonka trucks, tricycle, balls, bats etc. Croquet and other lawn games, sprinkler ball, hammock Our property is organically spray once a month for ticks and mosquitoes. Acadia kayak rentals is within a half mile from the house. They will deliver and pick up Rentals. Basketball Hoop. Rentals are available for boats, kayaks and bikes. Screened in porch with views of Eastern Bay. Ellsworth High School has free tennis. Hodgkins' House is turn key ready just bring your food and warm clothes just in case. The first floor is wheelchair friendly, however assistance would be needed entering the home by lifting up one step. It has an automatic generator system. So no need to be concerned if the power goes out. Paul & I have taken great pleasure in making Hodgkins' House our seaside retreat. The living and dining rooms are air conditioned. There are no pools but Bloomfield Park, less than a mile away, was the drinking water supply for the summer cottages, is a public freshwater beach. If you are brave enough for the Altantic water tempature there is Lamoine Beach and Lamoine State Park. Both are fun to hunt for what the sea left behind. Hodgkins’ House is a nice home for those looking to explore more than MDI. We had a great time exploring the Schoodic Peninsula, which is something we typically don’t do when vacationing at Acadia but the location of the house allowed us that opportunity. The house itself is just right for a family or two couples traveling together. The outdoor living area is peaceful and we enjoyed grilling steaks one night and using the lobster pot another. The fire pit is a nice touch and warmed us up on a chilly night. The house has pretty much everything you will need to enjoy a stress free vacation- from beach chairs and towels to all kinds of cooking and baking supplies. The property is perfect for dogs to run and play. The two car garage really made loading and unloading easy. While the house is a bit further from Bar Harbor than we are used to, we planned our days accordingly and made it all work without a hitch. The hosts are helpful, friendly and care about making their guests feel welcome and comfortable. We would happily return. We are very happy you enjoyed your Maine Vacation at Hodgkins' House. We try to make our home ready, as possible.for your stay. Thank you for being terrific renters. Come back to Hodgkins' House anytime. Hodgkins' House was perfect! We had a fantastic week in Lucy and Paul's beautiful house. The yard and the view were just as beautiful as pictured, and we loved pulling into the driveway and seeing the breathtaking view of the water and Acadia. The inside of the house was even more airy, open, and comfortable than we had imagined, especially the ridiculously well stocked kitchen. Our toddler loved running around the house, playing with the many (many!) toys, and playing in the yard on the swing/hammock, in the sandpit, with the trucks, and the basketballs. We very much appreciated the door to the 2nd floor so we didn't have to worry about his safety at all. We loved seeing Acadia and the harbor towns and also took trips to Deer Isle and the quiet side of Acadia (a must). And it was always a treat to come back to the house to relax and soak in the view. We very much appreciated the extra touches that Lucy and Paul's provide and would come back in a second! It is so nice of you, to take the time, to write this awesome Hodgkins' House's review. We try to make it as comfortable and inviting for our guests and ourselves. We have it thoroughly cleaned and ready to just walk in and enjoy the stay. Thank you for taking great care of our home. It is much appreciated. All the comforts of home, plus more! Hodgkins' House was the perfect home base for our recent visit to the area. There were plenty of toys and games to entertain the kids (ages 7 and 4), room for the dogs to play and relax in the sun, and everything the adults needed, too. From the warm welcome from Lucy to the well-stocked kitchen to the packed beach bag, our hosts really thought of everything! 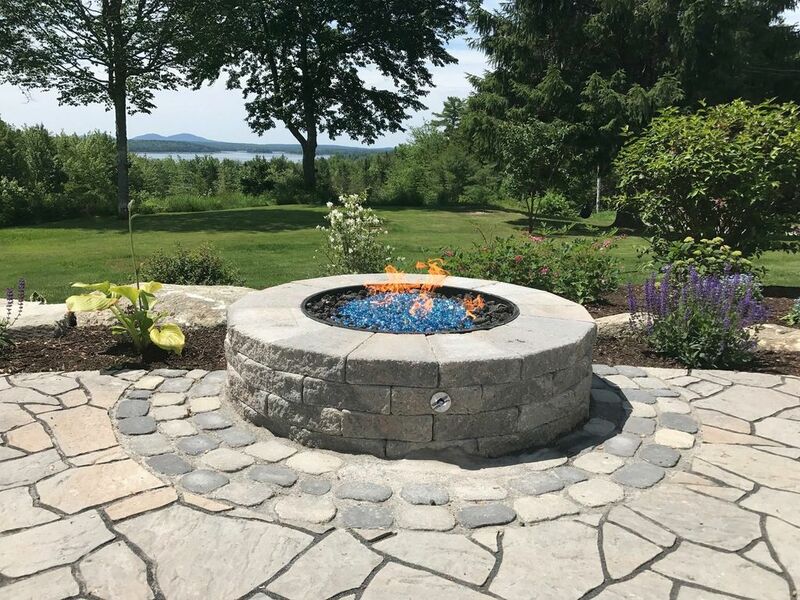 The location was also ideal, close to Bar Harbor and Acadia, restaurants, stores and more while still set back far enough to offer relaxation and some beautiful views. The bar has been set very high for any future travels and if we find ourselves back in the area, we would love to stay here again! We enjoyed our stay very much. Low key & peaceful. The drive to Bar Harbor is no problem, so you are away from the crowds. Thank you for leaving our home in excellent condition. Gorgeous view, very clean, great beds and towels, loved the location. Wonderful hosts! They were very accommodating and easy to work with. We were welcomed with fresh strawberries and a partially stocked fridge. The kitchen has absolutely everything from condiments to baking basics. We cooked in 70% of the time and never searched for a cooking item we couldn’t find. Loved the basketball hoop and the croquet set too! You can’t possibly go wrong here. The view, the breeze, all give a deep sense of serenity. Oh, thank you so much, for your five star review. Paul and I try to prepare our home, for your best vacation, home stay. The outdoor kitchen is a great new addition. I love how the seafood can be cooked and eaten outside, reducing the seafood smells and easy hose down clean up. Thank you for taking great care of our home. Please come stay again sometime at Hodgkins' House, for your Maine vacation. Lucy and Paul have outdone themselves making their property feel like home. From the comfy beds to the playroom to the amazing backyard and the fabulous kitchen they have thought of everything. Our only complaint was that we didn't book a longer vacation. This was the perfect location to explore Mount Desert Island and Acadia. Ellsworth offered all the shopping we needed and going back to the peace of Lamoine each night was so relaxing. We traveled with the adults and 4 children aged 7 - 15 and there was something for everybody. We would recommend this home to anybody! Thank you for the great review and taking great care of our home. We enjoyed meeting you and your families. So happy the kids had fun. Paul & I just put up a teardrop tree hammock, reading nock, for the next time you stay. Our grandchildren love theirs. You won't run out of trails to hike or ocean to see. Next time your family might also enjoy our Pine Cone Cabin, on Green Lake. It's about twenty minutes further from Acadia but a world of quiet relaxation and nature. It comes complete with kayaks, paddleboard, paddle boat, fish poles etc. Hodgkins' House is located on 11 well maintained acres in the town of Lamoine. This home has a well stocked island kitchen with granite counter tops offers a spacious area for the chef of your family. Renters can enjoy lots of space both inside and out for familys to spend quality time together or enjoy quiet times. We are have a installed a new patio kitchen with gas grill, sink and fire pit. It's lawns are large enough to host smaller weddings or family reunions. Avoid the travel hassle by flying into BHB only 7 miles from your home away from home. Pull into your two car attached garage and the fun begins. You will be about 25 minutes from a whale watch trip, Kebo Valley Golf Club, and all wonders of Acadia. Hodgkins' house offers beautiful views of the bay and mountains of Acadia. Be the first person in the USA to see the sun rise from the top of Cadilac Mountain or relax with a mug of coffee and watch the fishing boats work the bay. Other Activities: Whale, lobster and sailing trips along the shores of Acadia. Hike or horse back the carriage roads. Watch the surf at Thunder Hole after a big blow. Visits a small fishing village for lunch. Beach comb for sea glass and shells. Relax with a good book in the screened in sun porch. Play badmitten or croquet on it's lawns. Sip something cool on the back deck as you watch the sun set on Eastern Bay. Golf: Kebo Valley Golf Club is one of the oldest in the USA and the gem of Maine golf. In 1896 began play for Presidents, the rich summer residents and lobstermen. The challenging greens and rolling fairrways require you to play a wide variety of golf shots. Enjoy the majestic views of Acadia National Park and beware of the #17 the ''Taft' hole. Visitors are welcome. There are lots of other courses in the area. 100% refund up to 90 days before arrival. No additional fees.